For all the giggling golf endures from players of high-impact sports, we know that the kit you choose when you hit the course is a very big deal indeed, not least what you wear on your feet. 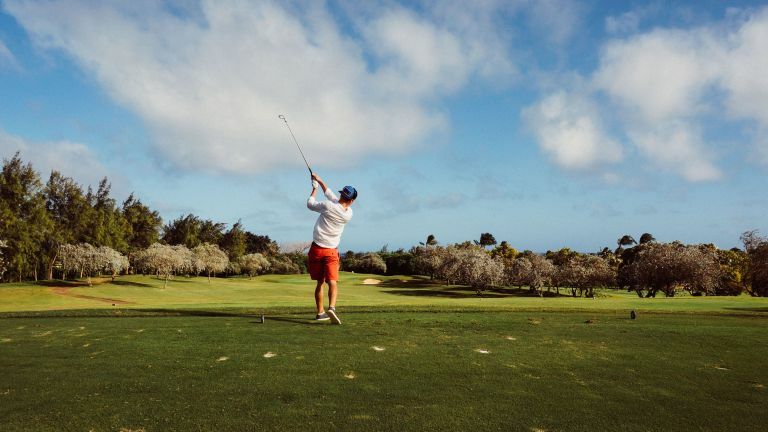 And when it comes to what kicks you wear to the course, the big choice golfers face is between a cleated or spiked golf shoe, and the relatively new development that is the spikeless shoe. While it might seem like a compromise between performance and fashion, the spikeless shoe is far from it. Our pick of the best golf shoes at the moment is the FootJoy Pro/SL. Stable, comfortable, and versatile, they’re not just for casual golfers, with many professionals also going the spikeless route. Whether for the low-key style that makes them look less like specialist sportswear and more like a street shoe, or for the posture-enhancing comfort, who can say — the beauty of a spikeless golf shoe is that it offers both. Plus, you don’t have to change when you get to the clubroom, so if you’re quick, you can get that first pint in before anyone else shows up. So you’re convinced that they’re useful, and good-looking to boot, but where do you go from here? First, think about the style you’d like — that spikeless golf shoes can be worn to and from play, and as a casual trainer, is part of their charm. However, if you enjoy donning the more traditional golfing attire, keep an eye out for the brogue-style golfing shoes. Remember, if you’re the type to brave the rain, you'll want to go for a spikeless golf shoe with substantial waterproofing, so add this feature to your checklist. Keep reading for the finer details on our best picks to help you decide, and you’ll be scoring albatrosses in no time. In a choice of smart-looking colourways, the modern FootJoy Pro/SL is a stylish shoe indeed, but its real star factor lies in its stability. It uses two types of special foam to give you all the support of a much higher-end shoe on all sorts of lies and slopes, but with superior comfort both underfoot and around the ankle. This is not necessarily a golf shoe for beginners as it is a big overkill for those who pop out for a casual game on a Sunday. However, for support, grip, and softness underfoot, it’s a real winner, for a reasonable investment. For the golf enthusiast who likes to indulge in a little street style, these shoes are a match made in heaven. Their all-white styling looks great, just as at home on the green as pounding the pavements, and the contemporary rubberised sole is a marvel of modern footwear technology. Its intelligent pressure-mapped system provides traction on all surfaces and doesn’t pick up debris, and the upper is waterproofed. For under £100 RRP, it’s very impressive, and probably the best looking golf shoe on our list. Never thought you could get that classic wingtip brogue look in a sports shoe? Think again, because in the Tour Event Spikeless, Stuburt have produced what is, without a doubt, the most dapper golf shoe we’ve seen. The tooled leather upper looks good, while the cushioned sock liner provides comfort, and the EVA sold gives you stability and grip. A beautiful-looking all-rounder that’ll take you straight from the cart to the clubhouse. These Skechers might not come in the most inspiring range of colours, but they look very smart nonetheless, with their low-hitting trainer style and perforated leather sides. Above all, they offer supreme comfort, with a padded collar and tongue, soft fabric lining, and high-rebound cushioning to keep you going through all 18 holes. If you prefer something a bit brighter, go for the FootJoy Pro/SL, but for trainer-style comfort with some sports luxe details, go for these. Following the rest of the sportswear world’s cues, these spikeless shoes from Puma are lean and light for sleek style on the course and effortlessly comfortable play. The slightly weird DISC closure system gives you a consistent fit, the leather saddle offers support in the midfoot, the foam midsole , and the upper features waterproof, four-way stretch mesh. Another great meeting of form and function, and slightly more performance-heavy alternative to the Nike shoe. When it comes to a shoe that can take you through your next match day, to the pub, and out for walks on the weekend, the ECCO Golf Casual Hybrid is a winning choice. With all the casual good looks of a leather trainer and the performance of a golf shoe, it offers the best of both worlds: the TPU outsole gives great traction, the nubuck upper is comfortable and durable, and overall, it’s a great investment if you don’t want to shell out for one-use shoes for occasional play. For lightweight golf shoes that won’t weigh you down over the course of a long match day, look to Mizuno and the Nexlite SL. If your feet tend to get tired soon into your practice, these are a great buy, with their breathable waterproof construction (the ‘Sofrina SK upper’ here is the secret to the shoes’ lack of heft) and impact grip system, ensuring stability throughout your swing and a solid, shock-absorbing base. Don’t be fooled by these seemingly lightweight shoes, with their breathable microfibre upper and springy sole, because they can really take a beating. The cork-covered EVA sole offers great comfort and bounce-back, the UA Storm waterproofing is very impressive, the midsole is incredibly responsive, and the ‘Rotational Resistance’ outsole offers superb traction. Flexible and grippy, waterproof and durable, these shoes are worth the investment for years of wet-weather play. These snazzy shoes look relatively unassuming from the top and side, but look at the sole, and you’ll understand the secret to their success. The cool-looking organic design, termed “spydr grip”, creates a web across the length and breadth of the gum rubber sole that leads to unparalleled grip in all surface conditions. Add to that the foot-supporting stability cage for proper posture and comfort, and you have a top-performing shoe - understandably though, it comes at a price.